We see it all the time – famous people teaming up with brands to encourage followers to get involved with a brand through their personal social media channels. Social media influencer marketing is a growing trend, and public relations professionals are incorporating it within their campaigns more frequently. However, there is more to influencer marketing than just sending a sample of your product to someone with a high follower count and hoping they post about it on social media. 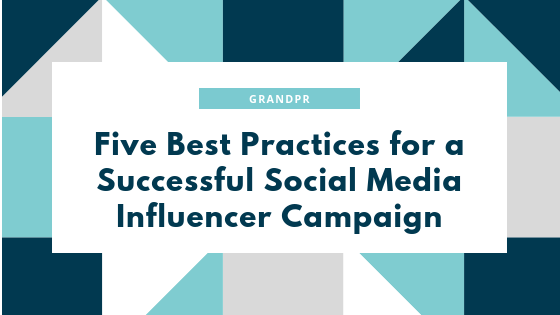 Consider the following five influencer marketing practices to get the best results from your social media campaign. When implementing a social media influencer campaign, it is crucial to pick someone that will reach your desired target market. Their followers must fit the demographics of the campaign’s target audience and stand for the same values as your company. Often times, campaigns use micro influencers with less than 100,000 followers to reach a concentrated audience and direct messaging towards a specific group of people. Analyzing the influencer’s social media platforms also allows you to see the culture of their content and what market they cater to. This practice helps your PR team decide if the influencer is a good fit for the job. Preparing influencers with a brief will help your brand get the most benefits from an influencer’s content. Briefs should include background about the company, the company’s values, the campaign’s goals, and any differentiating facts that highlight why the brand or product is a must-have. Without criteria and facts to use in their content, influencers may send the wrong message to the audience. Unpaid influencers tend to manage expectations differently and may be less willing to use provided guidelines. However, providing unpaid influencers with a brief can still benefit the campaign. Public relations is all about positive relationships, right? A company-influencer relationship should be collaborative and beneficial for both parties. Boosting follower counts and content engagement is the main goal for influencers, so the campaign should be designed to help them do that, as well as reach the goals of the campaign for the brand. In the designing stages of a campaign, PR professionals should always keep their influencer’s brand in mind to get the most out of the relationship. Essentially, an influencer’s content is a product or company review that the public values. To get the best content from an influencer, they should experience the product first-hand and be included in other aspects of the campaign such as exclusive events. Influencers will get a sense of the company’s culture and fully understand the features of products when provided with product samples. Just like an online product review, the better the experience, the better the review. Although influencers grab audiences’ attention, it is not enough to let them do all the talking on social media. A brand should be engaging with its influencer’s posts and interacting with followers. Interacting with consumers builds brand awareness and establishes relationships with an influencer’s followers. A brand can also help answer consumers’ questions better than an influencer can. Brand participation on the influencer’s social media will help drive engagement on the brand’s social media pages and the company website. Social media influencer campaigns are meant to be fun, creative and use personal testimony as a tool. As the trend continues to grow, there are countless ways to have a successful campaign with these basic strategies. Find what works for your brand, and have fun with it! Lexy Deckert is a senior at GVSU majoring in advertising and public relations and minoring in hospitality and tourism management. After graduation in December, Lexy plans to work in media relations or community outreach. After two years as a PRSSA member, Lexy recently took on the role of Programming Director for GrandPR. When she is not focusing on school, you can find Lexy reading, working out, or watching Friends.